Finally got some wheels to get around on Oahu. I didn’t drive, I got to spend time with a high school buddy Perry. 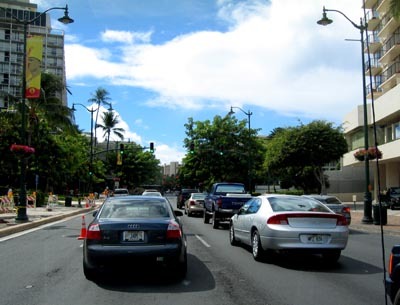 And we headed for Waikiki to catch up on old times and play tourist strolling around, but first we got into the usual Kalakaua Avenue traffic. The Hyatt Waikiki (is it still a Hyatt?) 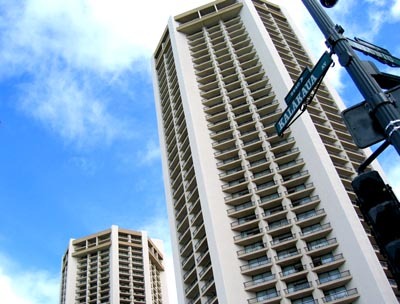 built by Chris Hemmeter on Kalakaua Ave. along with other grand scale resorts in Hawaii. Hemmeter was like a Donald Trump in Hawaii, a golden boy of big resorts and grand plans. He built the Hyatt Waikoloa on the Big Island which later ended up selling for pennies on the dollar to the Hilton chain. Hemmeter’s big thinking caught up with him in New Orleans with a casino that left him and his company bankrupt. He died last year without too much fanfare. 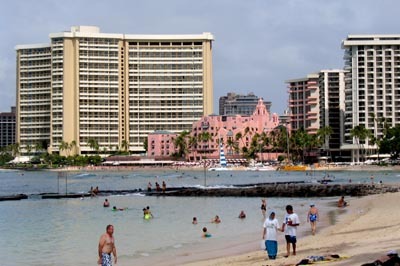 And farther down our Waikiki walk was the Pink Palace, the Royal Hawaii Hotel sandwiched between normal looking hotels. 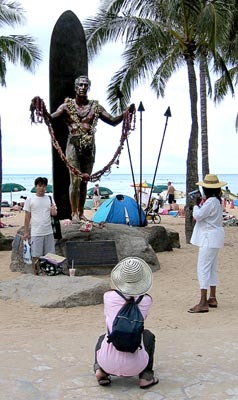 Tourists getting their photos taken with Duke Kahanamoku’s statue at Waikiki beach. Originally there was controversy as to which way Duke should face. Facing the ocean like a real surfer watching the waves, or okole to the ocean welcoming visitors to it. Well, you can see what won out. I guess the choice was right. Why get a photo next to Duke with a bunch of street traffic behind him. Some store in town had a walk-thru fishtank around its stairway. 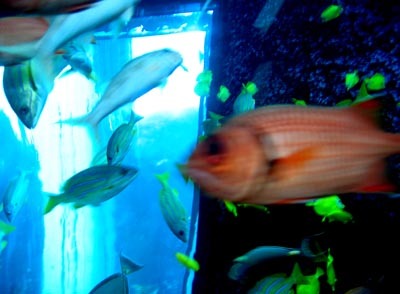 The fishtank was okay, but the air conditioning was great. Honolulu is just as I remember it, hot and humid. Maybe hotter than I remember it. 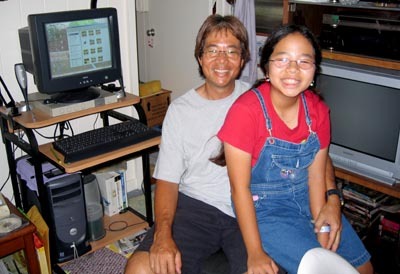 Out of Waikiki and back in Honolulu (I guess technically Waikiki is in Honolulu) to Perry’s place with his daughter Starla. I’ll have to tell her wacky stories about her dad one of these days. I’ve known Perry since the 6th grade at Kuhio Elementary School so I know a lot, ha. Plus not seeing him in such a long time there are no new memories to clutter things up. Thanks for taking the time to get together on Oahu Perry and thanks for the memories.